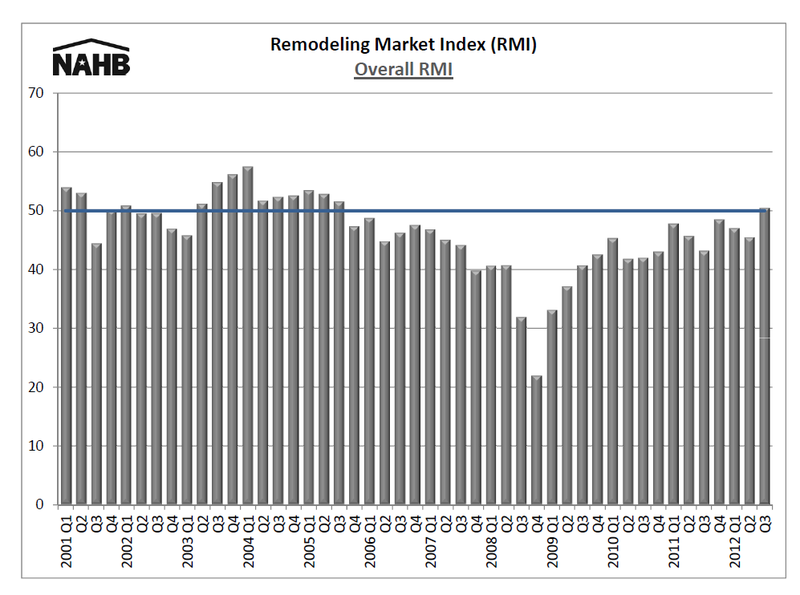 Remodeling Market Index Softens – silver lining still visible. At the Professional Remodelers Organization, we’ve been hearing that calls are slowing down a little this summer and the Remodeling Market Index seems to indicate that trend – but the real message here is that even with a slight drop this quarter, the market has still greatly improved over the last three years! 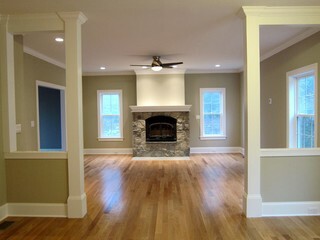 The Remodeling Market Index is published quarterly by the National Association of Home Builders, Remodelers Division. In the second quarter of 2011 the RMI dipped slightly from 46.5 to 43.9. Please follow the link below to read the full article from NAHB about the RMI and it’s trajectory. The residential remodeling market showed signs of improvement during the first quarter of 2009 with significant growth in all indicators, according to the latest National Association of Home Builders’ (NAHB) Remodeling Market Index (RMI). The current market conditions measure rose to 34.5 from 25.5 in the fourth quarter of 2008. Future expectations jumped to 30 from a historic low of 18.6 the previous quarter. The RMI measures remodeler perceptions of market demand for current and future residential remodeling projects. Any number over 50 indicates that the majority of remodelers view market conditions as improving. The RMI has been running below 50 since the final quarter of 2005, following decreasing remodeling expenditures since that time. The index component for national market conditions for major additions and alterations increased to 32.7 from 19.4 in the fourth quarter of 2008, while minor additions improved to 39.1 from 31.5. Maintenance and repair remained also climbed, to 30.4 from 23.6. Measures for future expectations showed healthy growth during the first quarter, with the component for calls for bids rising to 34.2 from 20.6. The backlog of remodeling jobs component climbed to 28.5 from 18.4, and appointments for proposals jumped to 35.3 from 19.1. Finally, the component that measures the amount of work committed for the next three months rose to 21.8 from 16.4. Remodelers perceived weakening demand for current and future residential remodeling jobs in last year’s final quarter, according to the latest NAHB Remodeling Market Index (RMI). The RMI’s current market conditions indicator slid to 27.7, down from 33.5 in the third quarter, while future expectations plummeted from 27.7 to 19.6. Both readings were historic lows for the index, which was started in 2001. Any number over 50 indicates that the majority of remodelers view market conditions as improving. The RMI has been running below 50 since the final quarter of 2005. Compared to the previous quarter, the 2008 fourth quarter RMI showed market conditions for major additions and alterations declining from 29.4 to 20.2, while conditions for minor additions and alterations dropped from 38.5 to 33.5. Maintenance and repair fell from 30.9 to 27.6. Overall, major additions and other large remodeling jobs have experienced a greater decline than smaller remodels and maintenance. All the RMI measures of future expectations in the remodeling market — calls for bids, amount of work committed for next three months, backlog of remodeling jobs and appointments for proposals — were down in the final three months of last year. Expectations for the remodeling market slipped in all regions of the country during the fourth quarter — from 32.9 to 24.9 in the Northeast, from 31.5 to 30.7 in the South, from 36.2 to 28.0 in the Midwest and from 36.1 to 25.0 in the West.